In the run-up to the Christmas holidays, it’s easy to get caught up in a frenetic whirlwind of activity. At our house that means school dance production rehearsals, Nativity plays, choir practice, dance exams, carol service in the local church as well as thinking about Christmas Day itself and all that entails. And yes, I’m busy with work too, in particular organising The Confident Mother virtual conference which opens on 12 January 2015. 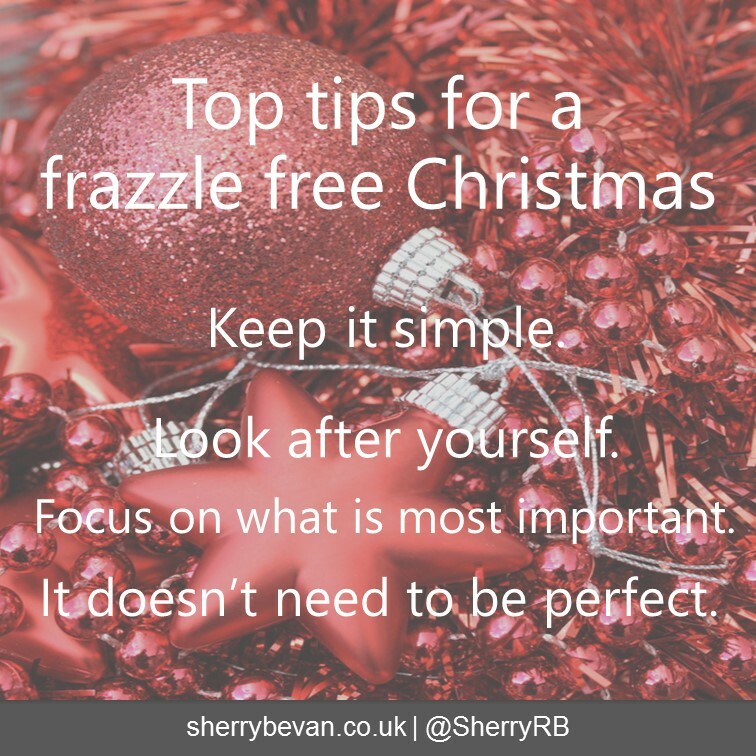 Today I want to share with you my top tips on how to have a calm and frazzle free Christmas without spoiling the joy for your children. I already shared these tips with my mailing list, plus I gave an early Christmas gift. Did you miss out? Become an Inspiration Party Guests today and you won’t miss out on future offers. Don’t try and do too much. Keep it simple – whether that’s the food you prepare, the travel you do, or the gifts you buy. More than anything, children want you and your presence. Are you the default Christmas “organiser”? Do look after yourself. Take just 10 minutes every day to just “be” and not “do”. Go for a walk round the block, do some stretches, put on some happy music and do a dance – whatever works for you so that you take 10 minutes out. Looking after yourself is one of the best things you can do to reduce stress and miminise short tempers in the holiday season. Thinking about Christmas plans in the past, I often tried to do too much because I was trying to please everybody and not really thinking about what I wanted and what was important to me and my family. Do think about what is most important to you and your family and focus on that first. Ha! Those who know me well will realise that “perfectionist” is my middle name. However I have learned to accept my perfectionist tendencies and acknowledge that not everybody is a perfectionist. So yes that might mean the girls wrap the presents less perfectly, or the icing on the cake is not perfect, and the decorations on the Christmas tree are crowded round a certain height. It’s ok. It’s Christmas. Who will notice if it’s not perfect. And if you do feel the stress levels rising, take time out. If it is something someone has said, bite your tongue. Hold that thought. Instead, have a cup of tea, or take a brisk walk round the block, or simply stop ‘doing’ and focus on being and breathing. I do wish you and your family a calm and frazzle free time in the run-up to Christmas. Curious about the free gift worth £200 that I offered to my Inspiration Party Guests. Sign up today and you won’t miss out again. What helps you to have a frazzle free Christmas? Please do share. Thanks for your tips Sherry. Will try to remain calm and keep things simple! Great tips Sherry, it is so important to stay calm at this busy time of year, I am failing miserably at calmness at the moment as the countdown gets nearer to the big day and so much to do for work and family. All will be well by Christmas eve when surrounded by family with glass of wine in hand but may evaporate by Christmas morning with 8 grandchildren let loose. Oh my goodness, 8 grandchildren. Enjoy your Christmas Eve then. It doesn’t have to be perfect is probably the one I struggle with the most as a self proclaimed perfectionist! The others on the list, do-able! Imperfectly perfect is an expression I came across today – how does that fit with you Robyn? Fabulous Sarah – I’m so glad that I’m not the only one that likes to shut the world out. Thank you for sharing. Thank you – glad you liked it. Just 10 minutes can make a big difference. Thanks Corinne. I hope you have a fabulous Christmas.